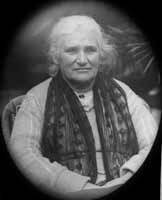 Mary Higgs arrived in Oldham in 1891 when her husband, the Reverend Thomas Higgs, took up the ministry at Greenacres Congregational Church. But Mary was not a typical Victorian minister’s wife and mother. At the age of 18 she gained a scholarship to a new women’s college, which later became Girton College, Cambridge, and was the first woman to study science to degree level, completing her studies in 1874. The year after the family arrived in Oldham there was a serious slump in trade. A dispute between cotton workers and their employers over a reduction in wages resulted in a lengthy lock-out. Mary saw at first hand how some women could lose their homes due to loss of work and she helped those she could. 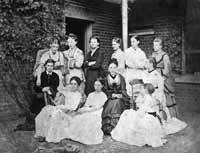 She also started to visit the workhouse and became friendly with Sarah Lees and her daughter Marjory. By the end of the 1890s Sarah’s husband Charles Edward Lees, a wealthy mill owner had died, leaving her with enough money to expand her philanthropic ideals. Mary persuaded her to support the setting up of a rescue home to take in homeless women and their children. A terraced house in Esther Street Greenacres was acquired. When Thomas and Mary arrived in Oldham their four children were aged between 11 and one. As they grew more independent Mary was able to spend more time on activities outside the home and church. 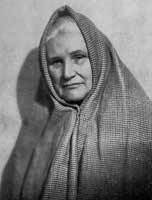 Through her contact with homeless women at the rescue home and workhouse she learned of the conditions many had to endure when staying in casual wards and common lodging houses. Workhouses had casual or tramp wards for men and women who needed short term accommodation, often while seeking work. Most towns had common lodging houses. These were run for profit and unregulated. In 1903 Mary took a radical decision; she would dress as a tramp and go undercover to gather information. In spring of that year, Mary and her friend Annie Lee, a cotton worker, travelled by train to West Yorkshire to begin their tramp. After enduring five nights undercover in tramp wards and common lodging houses, Mary published an anonymous report on her investigations. The report caused uproar and Mary decided to go public. In 1904 she was called to give evidence before a Government Enquiry. She took the opportunity to offer constructive solutions to what she saw as the many inadequacies of the system. Over the next few years Mary extended her undercover investigation to Manchester and London. Again she recorded her findings and also published a booklet on how to set up a rescue home. It was vital to expand provision in Oldham. Mary persuaded Sarah and Marjory Lees to purchase a 15 room house in West Street. This was converted into a Lodging House for women and also because the hub social initiatives. In 1907 Reverend Higgs died and ironically Mary found herself homeless. Sarah and Marjory made the cottage to Bent House available for Mary and two of her children. A year later, Mary became the Northern secretary for the National Association of Women’s Lodging Houses. Mary had grown to love her adopted home, but felt that something should be done to improve the environment. So in 1901 she wrote a letter to the Oldham Chronicle entitled Beautiful Oldham – Why Not? The following year the Beautiful Oldham Society was founded. Through schools, children were encouraged to care for and grow plants. Trees and other plants were bought by the committee and sold to businesses and groups at cost. Individuals were encouraged to plant window boxes and take up flags in their yards. This was a period in which the Garden City Movement was in full swing. Mary wanted to create a garden suburb in Oldham on the lines set out by Ebenezer Howard. Sarah and Marjory Lees sold land in Hollins at cost, and in 1909 Howard came to the official opening of Oldham Garden Suburb. After many years of pioneering and reform work, Mary was presented with the OBE in 1937. Following the ceremony she was unwell and stayed with her eldest daughter in London. Only days after receiving official recognition of her years of service to the people of Oldham, Mary Higgs died at the age of 83. There are copies of the book, 'The Amazing Mary Higgs' by Carol Talbot, in Oldham libraries.